Are you planning a grand romantic gesture? From proposals, to weddings, go full “Romeo & Juliet” with our collection of high quality artificial silk rose petals, perfect for scattering on tabletops at weddings or leaving as a trail for your beau as a surprise. Made realistically from high quality silk, order your pack today for fast UK delivery. Ah, la amour! Isn’t it wonderful to be in love? Our collection of artificial rose petals is perfect for decorating romantic occasions. 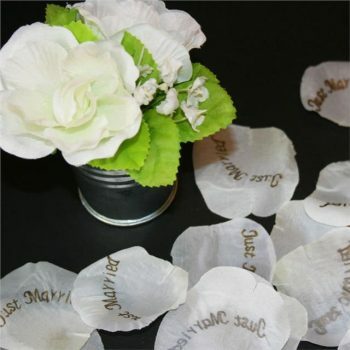 Our silk petals can be thrown, strewn and used to make virtually any surface beautifully romantic. They’re wonderful as tabletop wedding decorations or as a classy alternative to messy confetti. 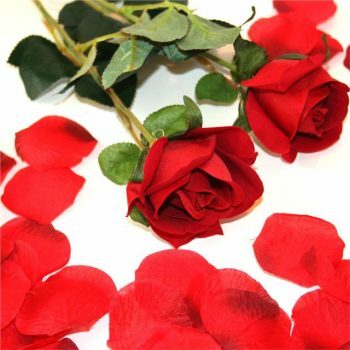 Why not use artificial silk rose petals to create a special surprise for the one you love? It might be their birthday, Valentine’s day, your anniversary or you’re planning to get down on one knee! These pretty silk rose petals are perfect for setting the mood and making romantic occasions even more special. Scatter them on the table for a romantic home-cooked meal. Leave a trail as a sweet surprise or run your amore a gorgeously decorated bath. Do you have any questions about our artificial petals? We’re always happy to help. Talk to our friendly team today on 01234 888789 for more information. Ready to get romantic? Place your order today for fast UK delivery. Not satisfied with your purchase? No problem. Our 100% customer satisfaction guarantee makes our seven day returns policy brilliantly easy.